The United States has cracked down on one of China's biggest tech companies, banning it from buying components from American firms. 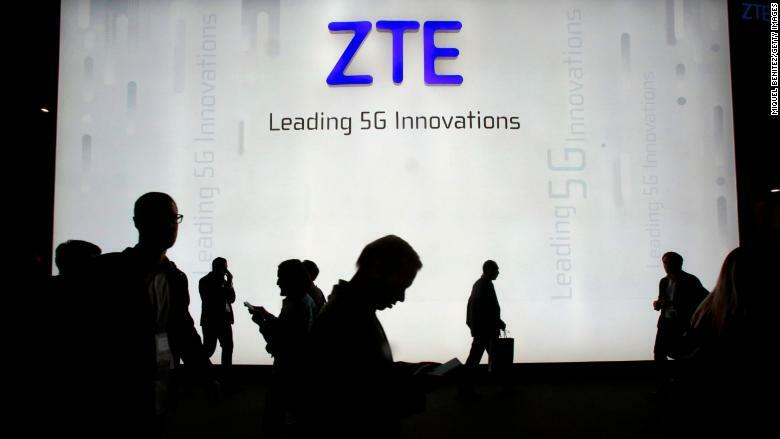 The move Monday by the US Commerce Department against ZTE (ZTCOF), which sells smartphones and other telecommunications equipment around the world, comes amid a tense clash between the United States and China over trade and technology. On the same day, ZTE also received a blow from the UK government, which warned telecom companies against using the Chinese firm's equipment and services. The US Commerce Department said that ZTE lied to American officials about punishing employees who violated US sanctions against North Korea and Iran. The Chinese company agreed to pay a $1.2 billion fine last year after a US investigation found it had illegally shipped telecommunications equipment to Iran and North Korea. But instead of punishing those involved, "ZTE paid full bonuses to employees that had engaged in illegal conduct, and failed to issue letters of reprimand," the Commerce Department said in a statement. As a result, the department said it has imposed a seven-year export ban on ZTE, forbidding American companies from selling parts and providing services to it. ZTE's smartphones use microchips from Qualcomm (QCOM) and glass from Corning (CNIG). ZTE said in a brief statement Tuesday that it is aware of the US ban. "At present, the company is assessing the full range of potential implications that this event has on the company and is communicating with relevant parties proactively in order to respond accordingly," it said. The company's shares were suspended from trading in Hong Kong on Tuesday following the US announcement. ZTE didn't address the developments in the United Kingdom, where the country's National Cyber Security Centre warned phone carriers that using the Chinese company's equipment and services poses risks to national security. The US crackdown on ZTE comes at a delicate time for economic relations between Washington and Beijing. The two sides have threatened each other with waves of new tariffs on tens of billions of dollars of exports. China's rise as a global tech powerhouse is at the heart of the trade clash. The United States accuses it of stealing American intellectual property and forcing companies to hand over sensitive technology. Beijing has rejected the allegations, arguing that it is stepping up efforts to protect intellectual property and that any technology transferred from US companies was done so with their permission. China's Ministry of Commerce said Tuesday, that it "will closely follow the developments" in the ZTE case. "ZTE has a wide range of trade and investment cooperation with several hundred American companies, providing the United States with thousands of jobs," the ministry said in a statement. "We stand ready to take necessary measures to protect Chinese companies' legitimate rights and interests," it added. 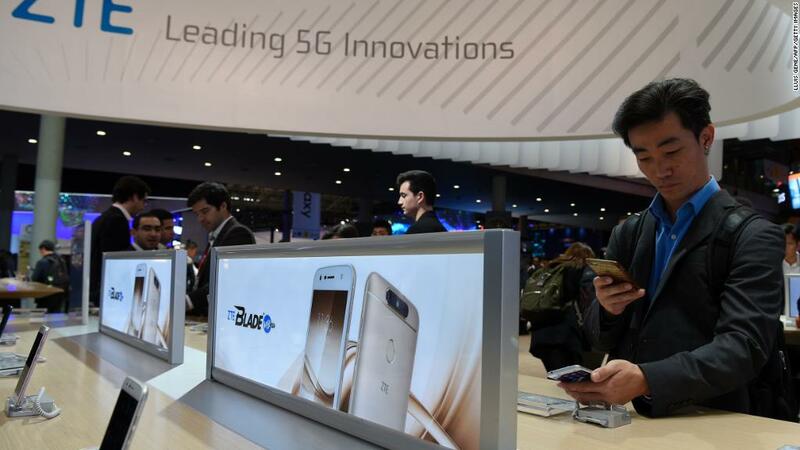 ZTE and Huawei, another huge Chinese company that makes smartphones and telecommunications equipment, have repeatedly come under fire in the United States in the past. In February, US intelligence agencies warned Americans against buying ZTE and Huawei phones, saying the companies posed a security threat to American customers. Huawei phones are already effectively shut out of the US market, but ZTE has made inroads. It accounted for 10% of the US smartphone market last year, making it the fourth largest supplier, according to market research firm Counterpoint Technology. ZTE and Huawei's alleged ties to the Chinese government were also the subject of a US congressional report in 2012 that focused on the equipment they make for telecommunications networks. The report said the companies "cannot be trusted to be free of foreign state influence and thus pose a security threat to the United States and to our systems." The Chinese companies strongly disputed the report's findings.